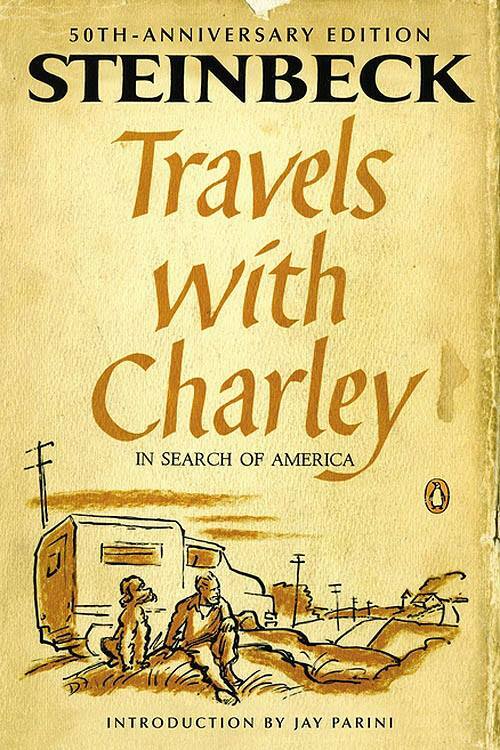 Early in high school, my English class read an excerpt of John Steinbeck’s Travels with Charley, his memoir about driving around the country in 1960 with his poodle, Charley, in search of America. I fell in love with it and dreamed of doing the same thing. 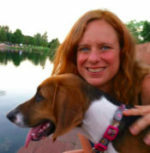 In the meantime, I was inspired to write “Travels with Socks,” a little memoir-essay about my family’s move from Hatboro, Pennsylvania, to Schaumburg, Illinois, with our drugged-out dog Socks when I was thirteen. I just recently finished reading the entire book, and it still affects me the same way. Other books sometimes make me feel like writing, but this is the only one I’ve met that that actually makes me write while I’m reading it. I read a few sections; I pick up my pen and notebook and spill out words; I read more; I write more. This is one of those sacred books for me. The first thing I noticed on climbing into the car to come to Chicago was my drugged-out dog staring at me with glazed eyes and a saliva-covered tongue hanging out the side of his panting mouth. The second thing I noticed was that his right front leg, along with a substantial part of the rest of his forequarters, was dangling off the car seat and that, due to the incline of the back seat of our car, the rest of him was soon to join it. Pulling him back onto the seat, I glanced at his face and noted his trusting, innocently cheerful, “Gee, Kel, are we having fun yet?” gaze, questioningly fixed on my face. Looking into that face reminded me once more of how much he resembles Odie. Reading my mind like he always does, he looked the other way and put his head down and soon thereafter began to snore. 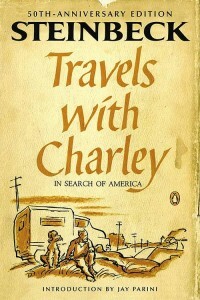 By this time, the rest of my family had settled themselves in the car, and, at the sound of the engine starting, we were on our way out of our driveway, Hatboro, and the entire Philadelphia area, across the Pennsylvania border and the Appalachians, and into the flatlands that epitomize the Midwest. I gazed out the window and wondered what I would find in this alien land called Schaumburg. My friends had reassured me, “You’re nice; you’ll make a lot of friends there.” I had thanked them for the compliment, but I still wondered. After all, this was the Mid-West. My vision of an area of center-city-type Chicago surrounded by miles of wheat fields and wild grass was roughly equivalent to native Chicagoans’ vision of “the East” as the Bronx, New York. Some enlightened dreamers also pictured “Bloomie’s” as a cubic mile of expensive clothes and silver patterns (not too far off from the truth, either). Anyway, I was pretty scared. I was coming from an area where people said they were going “out west” for vacation, and they meant Pittsburgh. To me, Chicago was simply home of the world’s tallest building and, at that time, the world’s worst baseball team. What kind of people could live there? These were the thoughts running through my head over the three days we spent traveling to our new residence. In the spaces when my mind was sick of thinking, I listened to my radio and/or talked to Socks (the name of my tongue-lolling dog). The fact that his inner eyelids were closed the entire time, which gave him this buffoonish, semi-stoned appearance, tempered my morbidly philosophical attitude a bit, and I found great solace in relating to him my life story and that of himself. He has the best sense of humor of anyone I’ve known, and what a listener! And he always agreed with me. His (and our) first “sniff” of the apartment we were to stay at while the previous owners moved out of our house revealed his (and again, our) distaste for it. For the entire three weeks we stayed there, he followed one of us around constantly, and if we looked in his direction, we would be confronted with a face filled with dismay that seemed to say, “What have I done to merit this rat-hole of a place which was obviously last inhabited by an unclean Doberman and in which I do’t even have my own couch to relax and unwind on?” I agreed. I don’t really remember the day-to-day happenings of that era of my life, except that each day seemed the same. I mostly remember sitting on my bed listening to Don Geronimo and playing repeated games of solitaire while the rest of the family watched TV. Come to think of it, I must have spent close to six hours a day playing solitaire. I had names for the cards. And I was getting sick of hearing “Windy city weather” jingled at me all day long. Our first day in our new house was beyond belief. I realize now that had we had a movie camera at the time, many a person could have been entertained well when it came our time for showing home movies. Walking in, the first thing we noticed was the expanse of color. Altogether, six rooms were covered by this ultra-bright, knock-your-socks-off, electric royal blue carpet, counting the stairs and the upstairs hall as one room. Two bedrooms were chocolate brown wall to wall. The kitchen was enveloped in red-and-green plaid wallpaper. One bedroom (with a super-blue floor) was painted the darkest light blue imaginable, with homemade, built-in, ultra-bright, knock-your-socks-off, electric, fire-red shelves. My room had homemade Noah’s Art curtains. Despite all this, we managed to console ourselves with the knowledge of the eventual arrival of more serene wall, floor, and window coverings. At this point, my parents had gone back to Philly for a few days to supervise the movers, and my grandmother was staying with my sister, Socks, and me. As all of our furniture was still at our old house, we rented three cots, a card table and chairs, and a television. With these exquisite furnishings, we made our existence in our new house somewhat tolerable. In fact, the only real problem was lights. At one point, my grandmother came upstairs and found my sister and me both in our respective closets doing our homework because there were built-in lights in them. They were two of five electric lights in our eleven-room house. Two of the others also resided in closets; the fifth was a red and white stained-glass hanging lamp in the kitchen (to match the wallpaper). Things improved when my parents came home, with the furniture close behind them. Soon after, wallpaper and carpets were ordered. By now, school had begun, I had made friends, and there was a noted improvement in the condition of Socks. Having been kicked of his temporary doggy-downer habit, he was markedly more cheerful (if, indeed, possible), especially when his sofa arrived. Now we have been living here 2 years and 5 months, and it is home. Socks has positioned himself so that his tail is fanning my face. Now he turns around and gives me a look that I by now know says, “Cookie time, Kelly,” so I get up and get him a dog biscuit—large-sized because it makes him feel macho. Say good night, Socks. Good night, Socks.